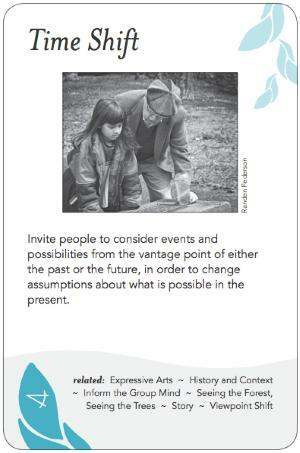 Invite people to consider events and possibilities from the vantage point of either the past or the future, in order to change assumptions about what is possible in the present. People have a tendency to believe that however things are now is how they will always be, and perhaps how they have always been. Many of their assumptions maintain the status quo, blocking possibilities of doing things differently. For example, there is a phrase among Quakers when faced with a stick-in-the-mud member: "There won't be a change on that until there's been a few good Quaker funerals." This belief itself can prevent change from taking place. People may respond by aiming deliberately low for what they see as achievable instead of what they really want, by questioning the value of collaboration, or being generally pessimistic. Time Shifting is one way of opening up new possibilities. Occasionally Time Shifting may also be helpful in confronting unwarranted optimism, e.g. "If we build it they will come." By envisioning the future and how to get from here to there, that assumption too may be unpacked, to be replaced with realistic preparation. Time Shift methods may engage the whole group together, or invite individual contemplation and/or research (see Subgroup and Whole Group), that then affects the whole group field and the individuals. There is also a spectrum of structure from telling stories, to providing incomplete stories and inviting people to complete them, to asking people open-ended questions. A more structured method such as Scenario Planning requires significant research to create credible possibilities distinct from the assumptions people have in the present. The company that is currently the leading practioner of this method is Global Business Network. Their method involves identifying driving forces, then constructing stories about how these forces could interact to produce different outcomes. 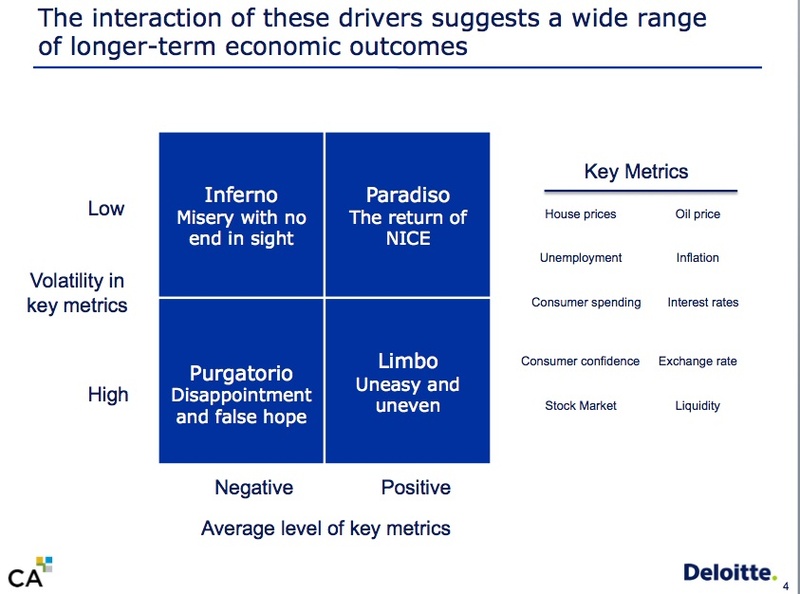 For example, Michael Raynor worked with the Canadian Institute for Chartered Accountants to come up with four scenarios, based on positive and negative predictions of two factors (market volatility and key economic metrics such as housing and oil prices). If you provide incomplete stories about the future or past, you can then invite people to respond by stepping into the gap between what is known and what might or might not happen. For example, you can explain a situation, and then offer several possible outcomes, asking people at each item whether or not they think that particular outcome will happen. In working with incomplete stories people become invested in learning more and exploring possibilities that expand existing horizons. If you ask a personal, future-looking question, like "How do you think your job life will change?" many people cannot leap directly to a novel or useful answer. In contrast, asking "What happened in the last five years that was surprising?" primes people to realize that quite dramatic changes have happened in the past and helps them have more expansive ideas about the future. This principle is the basis of Appreciative Inquiry, which deliberately investigates the best experiences of the past in order to create the most desirable future. Time Shifting is quite commonly used for groups working on their vision. "Imagine it's 5 years from now and all your dreams for this organization have come true. What's happening? Look around and tell us what you see." A classic version during the early stages of a forming intentional community is to have people imagine that they've already moved in and are welcoming a visit from a grandchild or close friend, showing them around; or that they are writing a letter describing the community to their cousin who's never visited. While use of this pattern for visioning is appropriate, it can often be applied productively on other occasions too. Some Time Shifting methods (e.g. Future Search, Appreciative Inquiry) use a whole spectrum of time, moving from past, through present, to the future. "What has your experience been?" "How did you meet the challenges?" "What helped you keep your resilience through so much loss, chaos and change?" "What did people learn from living through all that?" As Tom Atlee describes, "Imagineering embraces any use of imaginative narrative to realize, create, or catalyze in real life the potentials we are imagining." He lists a bunch of examples drawn from books, movies, and other media. Early on in a Future Search, a group timeline is created elaborating the history of the issue or organization. Anyone can add anything to the timeline and no arguments are permitted, so this approach allows for historical ambiguity. In the middle section, present trends and concerns are discussed. Later in the process, future ideas for action are considered. World Game opens with a multimedia timeline from early in Earth's existence, through the development of life, and eventually the participants (representing the world human population) coming onto the map, slowly as individuals, then in small groups, then a rush at the end as we cover the continents, and may not even fit on land in some of the densely populated parts of the map. A visceral sense of the pace at which that we're saturating the planet. Coming Back to Life by Macy and Brown, Chapter 9.